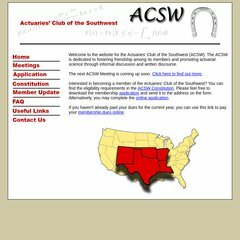 Topics: Acsw Constitution, and Application. Age: It went live on July 12th 2002, making it over 15 years, 9 months old. It is hosted by Godaddy.com Inc (Arizona, Scottsdale,) using Apache web server. There are 2 Nameservers, ns04.domaincontrol.com, and ns03.domaincontrol.com. Acsw.us's IP address is 208.109.181.132. PING (208.109.181.132) 56(84) bytes of data.